This pattern is available from etsy.com for €3.50. 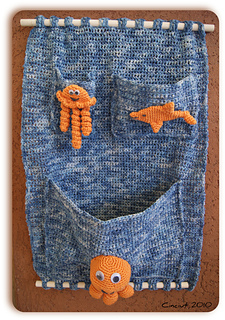 PDF crochet pattern instructions for a very nice and useful wall pockets to be hang up, with some sea characters made with amigurumi technique. To crochet it you need to know basic crochet and amigurumi technique. Final size of the wall pocket around 13.7x18.5 inches (35x47cm). Pattern available in English or Italian.